Bill Leach is CTO and co-founder of PreEmptive Solutions. He provides technical vision and leadership for PreEmptive Solutions' products, including Runtime Intelligence Services and Dotfuscator. He has extensive experience in software development and architecture. 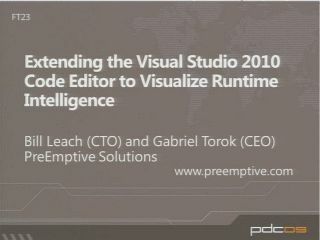 Bill has been building Visual Studio extensions since 2002.